Space tourists, dressed to thrill. Maybe one day people about to make a quick jaunt into space will be able to pick out an appropriate outfit at the local Nordstrom or Gap. In the meantime, several companies are brainstorming ways to dress passengers on the first tourist craft. Some efforts are practical, based on sound aerospace engineering, while others are in the realm of couture: more a matter of making an aesthetic statement. A dramatic example of the latter debuted in November 2006, when a woman strode down the runway of a fashion show in Tokyo wearing a dress that looked like a giant upside-down shredded coffee filter. "The idea was that when you're in zero gravity, the thin, sheer fabric will float," says Chuck Lauer, vice president of business development for Rocketplane Global, Inc., an Oklahoma City company that hopes to offer suborbital tourist spaceflights in its Rocketplane XP, which will take off and land like a conventional aircraft (see "The O Prize," Oct./Nov. 2007). The dress was one of the unusual creations on parade at the Hyper Space Couture Design Contest, which was born when Misuzu Onuki, Rocketplane's director of Asian business development, asked a simple question. "The only thing we've thought about from a clothing standpoint was, well, everyone wears blue flightsuits," says Lauer. "Misuzu asked, 'Do you have to wear that?' I hadn't thought about it before. It literally came from that." Onuki organized the contest with Japanese fashion designer Eri Matsui. Entrants—there were about 1,000—provided sketches of their designs. The final runway show featured the 11 best. "The president of the Japan Aerospace Exploration Agency was a judge," says Lauer. "It was like having [NASA Administrator] Mike Griffin judge a fashion contest." The winner, Midori Umetsu, had created matching mother-daughter space outfits. She is now working with Rocketplane to produce her design for the company's customers. "[Her outfit] will have to satisfy some fairly demanding technical requirements," says Lauer. "It will have to be flame-resistant and practical enough not to interfere with seat belts, seating, or emergency egress." The leader of the commercial space race, Richard Branson's Virgin Galactic, is less forthcoming; the company would not comment on suit designs for its SpaceShipTwo passengers; nor would superstar designer Philippe Starck, who is consulting with the company on early sketches. In an e-mail sent by his public relations team, Starck says only that his new spacesuit "reflects the emotions the Virgin Galactic astronauts will experience." The designers at Orbital Outfitters, a company devoted to producing suits for space tourists, are also interested in getting the look right. Explains founder Rick Tumlinson: "We have what we call the Dude Ranch effect. When you go to a dude ranch, you don't just want to look like a cowboy. You want to look like John Wayne playing the part of a cowboy." Still, the company isn't neglecting the engineering. Tumlinson has partnered with Bill Stone, an underwater cave diver who will contribute his expertise to creating self-contained life support systems; Chris Gilman, a renowned movie special effects and costume designer known for his spacesuit replicas; and John Clark, a flight surgeon and survivability expert. 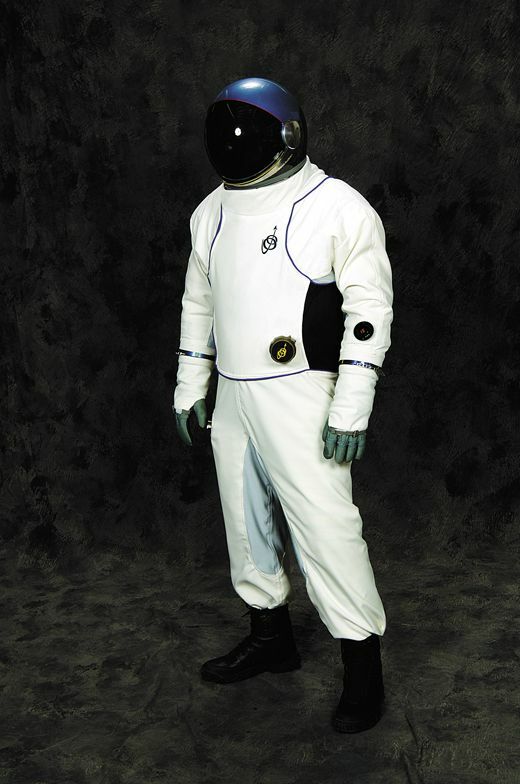 For emergencies, Orbital Outfitters is designing two kinds of suits: The IVA—intra-vehicular activities—suit would activate if cabin pressure is lost, providing the passenger with a safe, pressurized micro-environment, while the EVA (extra-vehicular activities) suit would be used if the passengers needed to exit the spacecraft. Other companies, anticipating possible EVA scenarios, have requested suits with parachutes. Each spaceflight company has different suit requirements (and color schemes). "XCOR's flight experience involves a certain set of activities that Rocketplane's doesn't," says Tumlinson. 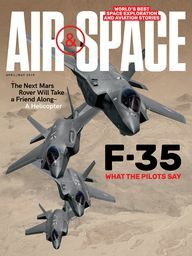 "Some companies won't have people leaving their seats or floating around at apogee [the highest point in the flight]." And thus the need for a giant upside-down shredded coffee filter. If you can't float around the cabin, at least your clothes can.